A Partnership between the Uganda Conservation Foundation and Uganda Wildlife Authority. 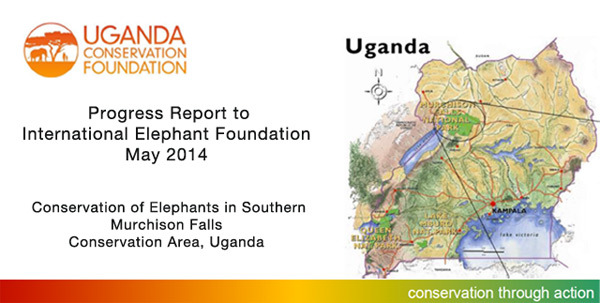 If UWA and UCF can successfully protect southern Murchison Falls Conservation Area, Uganda’s elephant population could triple in ten years, and many other species numbers could also recover handsomely. After forty years of complete neglect and few patrols, the last years has seen a significant increase in patrol coverage – with a near 100% prosecution rate. Based on both the previous research book ‘the elephants of Bunyoro (Law, Parker and Johnston, 1974) and field reconnaissance, three ranger posts were last year in southern MFCA to protect key habitats known to be used by the remaining 500 elephants. The Bulaya Ranger Post is on the most easterly side, on the Bulaya River (stream). Others are Mupina and Bugana. Four rangers are now present in each post – and poacher strongholds are being reclaimed. Where once the largest density of elephants in Africa lived, and where culling first took place, there will be a recovery once again. Having a permanently based ranger capability in the area is a prerequisite to ensure that a foundation of protection, law enforcement and development can occur. UWA now in a better position to defend and protect the wildlife.